As life seems to be racing along at an uncomfortable pace, where days, weeks and months are merging into one, I was asked by the BBC to talk about why I ride and where it all started. Something that’s still a ‘bit of a grey area’. Watching ‘David Beckham: Into the Unknown’ almost (definitely) had a part to play. 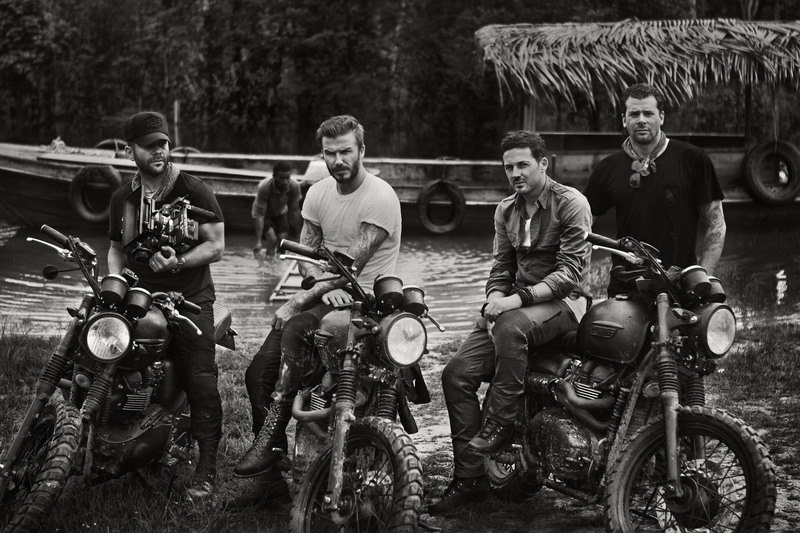 There’s something about watching David cruise across South America accompanied by his closest mates on custom Triumph Bonnevilles that does it for me. With minimal hesitation and no approval from the parents, myself and Sam committed to the CBT (Compulsory Basic Training). Being a professional cricketer, the summer comes with mixed emotions. From excitement and satisfaction, to nerves, pressure and expectation; buzzwords that are probably common across most professions. Underneath these lids (unnecessary colloquialism for helmet), there are both differences and similarities to professional and personal life. Both lids come with the same sense of the unknown. I dread to think the time we spend trying to foresee the unpredictable. As much as you prepare for various situations, be it a Sunday morning ride or facing the next opponent on the cricket field, we have to accept we’re going ‘into the unknown’. Very rarely do you see two experiences mirror one another. And that’s present in everyday life. Every time I get on the bike, the wind is different, the road surface is variable and Bill in his white van is definitely unpredictable. Every time I go into bat, the way in which the delivery is bowled and where is completely out of my control. The only thing I can do is react with my best judgement; an analogy that I believe we spend our whole lives doing. Think I’ve accidentally stumbled into a moment of philosophical genius. This professional mask that we slide on doesn’t change who we are and how we think, how we overcome obstacles thrown into our path, celebrate success, or even how we look out for others. It’s you, it’s who you are, in any walk of life. Both lives are timeless even if certain elements are transient. Both motorcycling and cricket have been here for a long time before me and will continue to exist after me (hopefully). As much as they both are ever evolving – electric motorcycles being pushed by major manufacturers and shortened cricket formats headlining world cricket – the values, tradition and skill still remain prominent. Where does the professional and personal life divide? As I’m performing a mental Q&A in the local coffee shop, it does actually provide a different and worthwhile moment of reflection. For me, riding provides a life outside of cricket (work), it provides me with the opportunity to meet people from different professions, backgrounds and cultures. It’s a life of little expectation and complete freedom. The only expectation is ‘to come back in one piece’ as directed by mum, which of course, is absolutely the most important factor. As I’m slowly creeping towards escapism (yes, I’ve stumbled across a new word), I think lots of people seek a personal venture to put life’s harsh demands to one side. A great example I remember is watching two of my South African teammates go fly fishing in the nearest river after six hours of cricket played that day. A vehicle they’ve chosen to relieve some of the stress and pressure that comes part and parcel with professional sport. There’s a perception that playing a professional sport is a dream job, and I undoubtedly don’t deny that. I play the sport I love and get to travel the world whilst doing so. On a bit of a tangent… Sometimes, I believe ‘we’ lose a sense of reality. We lose a sense of what is actually important, and that can turn this dream job into a stressful and emotional rollercoaster. ‘Winning and performing on the pitch is the only thing that matters in life’ becomes the unfortunate mantra many professionals have to deal with. With your daily performance under the public microscope and often scrutinized, this psychological outlook can be blown out of proportion. I was lucky to be part of an academy based in Australia led by cricketing legend Darren Lehmann, where he spoke confidently about where cricket should lie in your life priorities. I think it surprised everyone who was sitting attentively in the room that it wasn’t considered number one. Family, friends, health came first… the list went on. Major strings to life that he believed mattered most. Maybe I was on a subconscious journey to find a metaphorical vehicle to get away and stumbled across two wheels and an engine – not so metaphorical after all. What is it about motorcycling? Surely you don’t need a 1000cc V twin between your legs to ‘get away’ from the real world? Of course not, but If you’re a bit weird like me then it helps. For me, riding helps me think. But in saying that, I think it does the exact opposite. It helps me ‘power-down’. As other riders will know, you have no other option but to focus on the road (and no, I’m not just writing that because my mum reads these). When you’re on the bike with little to think about apart from the sound of the engine, the gear you’re in and how you’re looking to take the next corner, it’s a breath of fresh air for the mind. No one can call you and more importantly let your phone distract you. The initial buzz of jumping on my first bike (and it’s here I wish I could tell you it was a 1000cc sports bike, but in fact sounded and resembled something similar to my dad’s lawnmower), still puts a smile on my face to this day. It’s that lawnmower that has led me to ride over ten different bikes to date (and counting), I think. Upon reflection, in a perpetual motion of contracting thoughts, riding has given me an amazing opportunity to travel along some of the best roads in the world and meet some even better people; a pretty weighty argument to outweigh the risk involved. With off-road riding, track days, expeditions to ride the Himalayas, South America, USA and Europe slowly creeping into the bucket list, the future is exciting. And Baffle Culture? We’re slowly getting closer to getting some rides sorted this summer to bring some fellow legends together to share what we love. There might even be a refreshing beverage along the way.